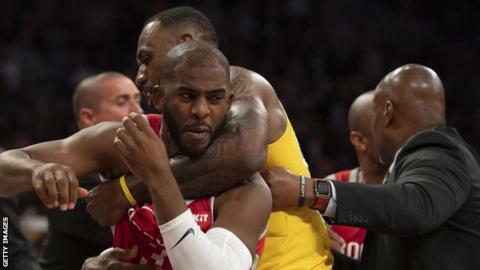 LeBron James' home debut game for the Lakers was marred by fights as they played against Houston Rockets at the Staples Center on Saturday night. 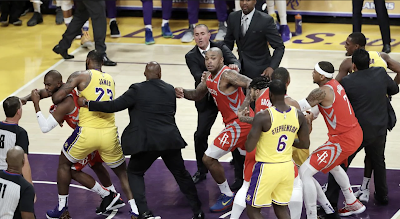 The brawl erupted in the fourth quarter of the game when Brandon Ingram shoved James Harden with Chris Paul and Rajon Rondo getting into a heated discussion. Paul was seen pointing his finger into Rondo's face which escalated into punches being thrown between the two. Ingram, Rondo and Paul were ejected from the game after officials reviewed the incident and the three will likely face suspensions and fines from the league.